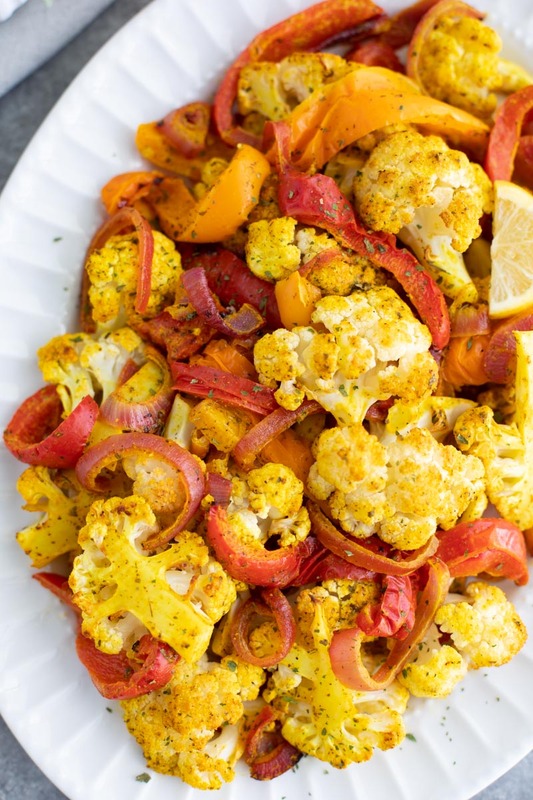 Roasted lemon turmeric basil vegetables are coated in a bright and tangy sauce that will thrill your taste buds! Load it on top of quinoa or pair it with chicken or fish for a healthy dinner! I haven’t been cooking, cleaning, organizing or basically anything along those lines since before the wedding. Its been three weeks! Agh! After the wedding, we were so exhausted from everything that I just didn’t have the energy to cook at all. So, we ate out. A lot. We barely ever normally eat out, so our bodies and budgets have not been too happy with our new eating schedule. Then it happened, my yearning for creating and cooking came right back to me last night! I started thinking about flavor combinations based on the seasonal produce that I’d seen at the market yesterday afternoon, while I was supposed to be sleeping. No counting sheep for me, I was watching blood oranges, satsumas, and Myer lemons jump around while I dreamt up a citrus themed party in my head. Lately, my local market has been overflowing with the most beautiful organic produce! I stocked up on bell peppers when I found them on sale for only $2.49lb, I bought 10 lbs! Woot, woot! I’m sure you’re wondering what do I do with that many peppers, right? I’ll tell you! First, soak them for 20 minutes in a large bowl filled with a water and vinegar mixture. Dry them, then remove the seeds and membranes. I leave at least 6 peppers whole (seeds and membranes removed) before I freeze them. When I feel a craving for salsa stuffed peppers coming on, I already have the peppers cleaned out and ready to stuff! You can let them defrost in the fridge or fill and bake them frozen, either will work. Dice or slice the rest of the red, yellow, and orange peppers. Use a FoodSaver to freeze 1 lb portions of each for future soups and casseroles. It’s so convenient to just be able to reach in the freezer and have the peppers ready to go! Want to get my personal list of organic produce rock bottom prices chest sheet? Sign up below! 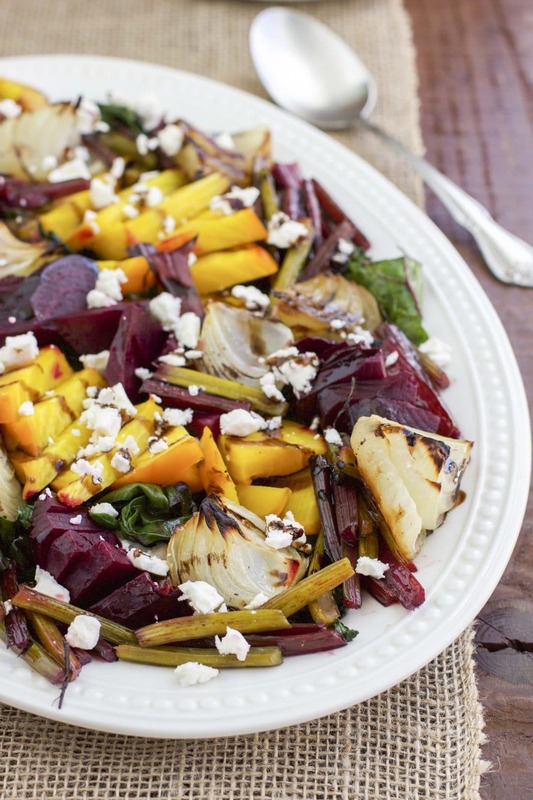 I love roasting veggies, it’s so easy and quick! I often just roast them with a little bit of coconut oil, salt, pepper, and garlic but sometimes you just need more flavor! I blended up the zest and juice from a lemon, turmeric powder, basil leaves, salt and pepper in my Nutribullet and made the most flavorful sauce to pour over the veggies! It’s so tangy and bright, I love the color the turmeric gives the cauliflower too. The basil isn’t overpowering at all, its just a light undertone that gives the vegetables another layer of flavor! You could make a quinoa or rice bowl and load it up with these lemon turmeric basil vegetables or serve it as a side dish with grilled chicken or roasted salmon. 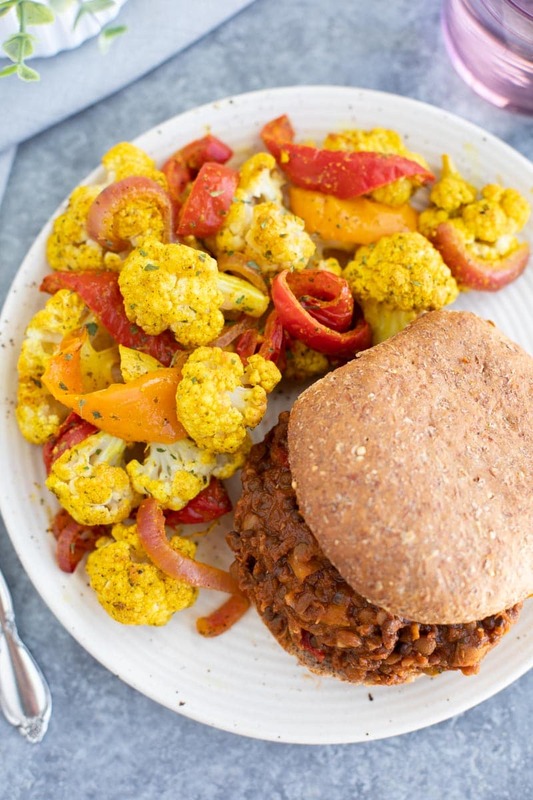 So many options for these flavor-loaded veggies! Add lemon zest, lemon juice, olive oil, turmeric, basil leaves, salt and pepper to a high-powered blender. Blend until smooth. 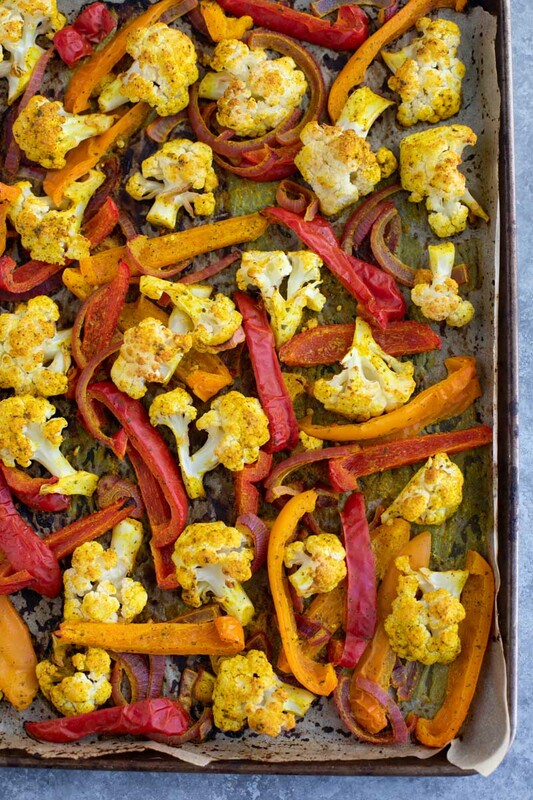 Arrange cauliflower, bell pepper slices, and onion slices on a parchment lined tray. Pour sauce over the vegetables, stir to coat each piece. Cover the vegetables with a piece of parchment paper or foil, roast for 25-30 minutes or until tender. If you make these roasted lemon turmeric basil vegetables and post a picture on Instagram, please tag me using the hashtag #StaceyHomemaker so I can see your delicious creation! What would you serve these lemon turmeric basil vegetables with? Let me know in the comments!